Barratt Homes Bristol Community / Community Projects / Bristol Pride 2018 – Best Ever! 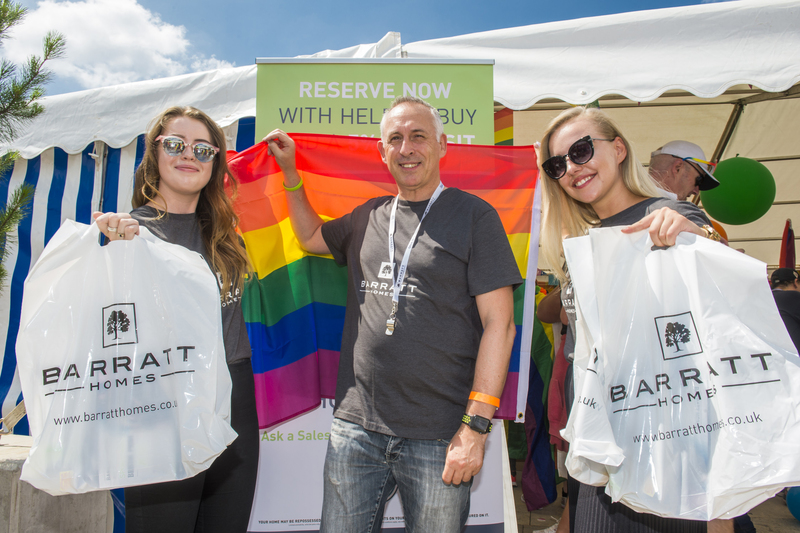 Bristol Pride has thanked Barratt Homes for helping to make the city’s 2018 Pride Festival the best ever. Barratt marked the city’s celebrations with special flags placed at its developments throughout Bristol. Bristol Pride again saw record numbers attending the festival. More than 12,000 people took part in the biggest ever parade march through the city and over 35,000 people attended the main festival making it one of the largest Pride events in the UK. Seen at the Barratt Bristol stand in the city’s Millennium Square are (left to right) Ruth Hodkinson, Assistant Technical Co-Ordinator; Shane Gathercole, Assistant Accountant and Natalia Colonova, Assistant Technical Co-Ordinator.